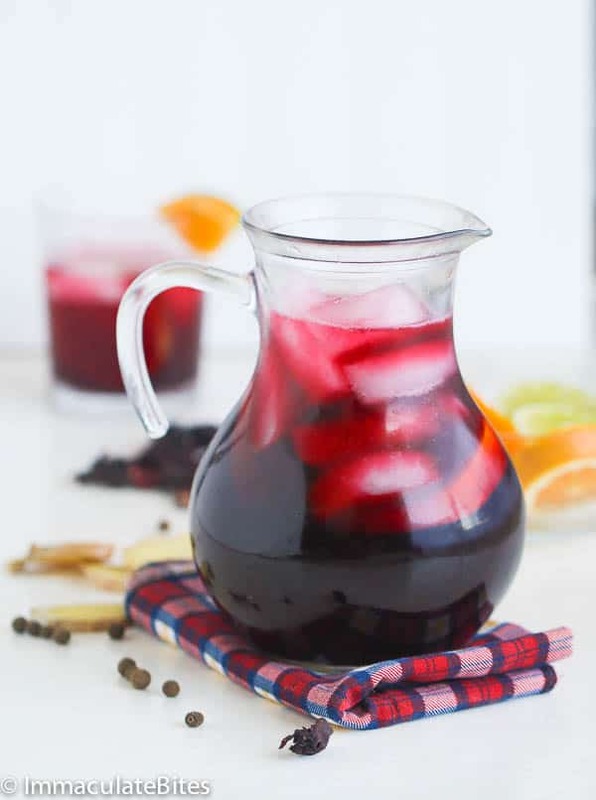 Celebrate this Holiday Season with this Sorrel drink here. 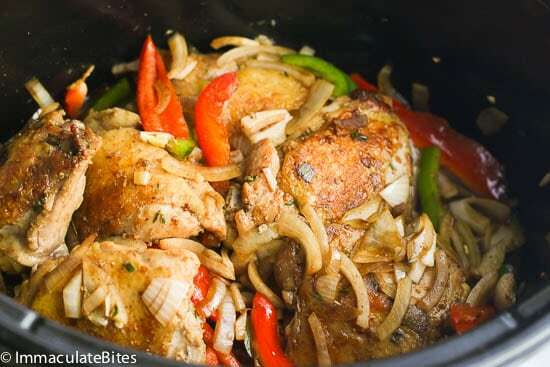 When adding chicken, it is a great idea to brown the chicken first, for a few minutes, sauté the garlic, onions stove top, before adding to the crockpot. Small step = huge flavors. If you want to throw everything in the crockpot and cook away, that’s fine too. I tried it and it wasn’t bad at all. But I prefer the former. 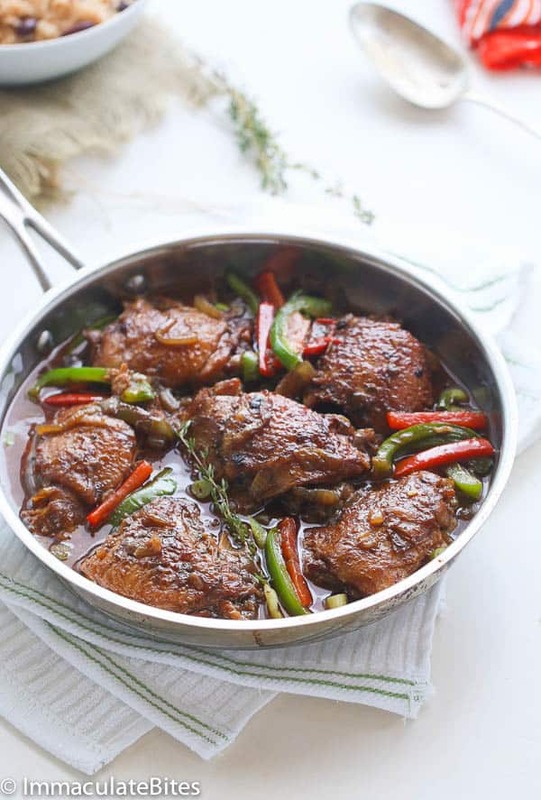 Jamaican Browning sauce aka burnt sugar is a favorite West Indian condiment use in most households to add, sweetness and color in stews, soups, and even cakes. 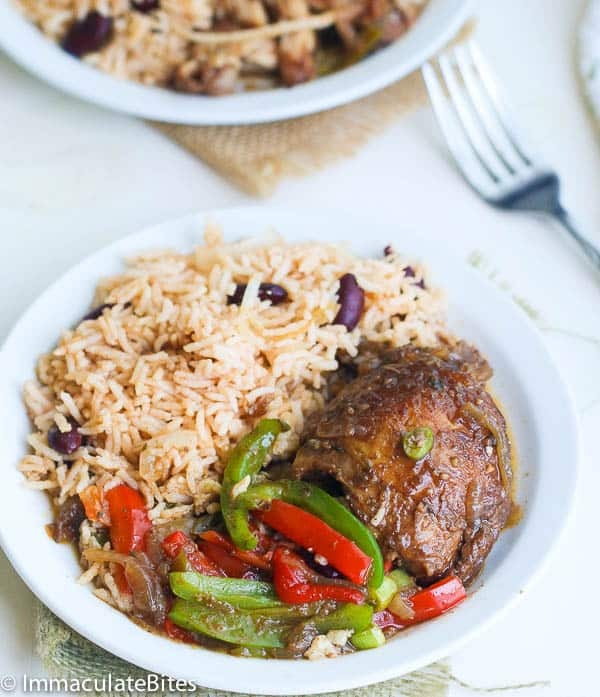 Slow Cooker Jamaican Brown Stew Chicken — An incredibly rich-in-flavor all time Jamaican classic- Jamaican Brown Chicken Sauce right in your slow cooker. 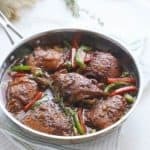 When ready to cook heat up a skillet or large sauce pan with about 2 tablespoons oil, and then brown the chicken about 3-4 minutes until chicken is golden brown: remove and place in the crockpot. 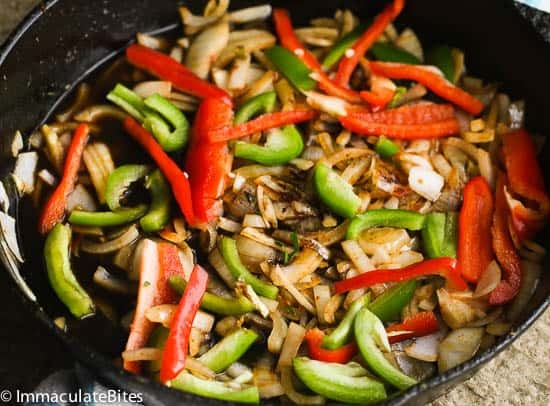 Drain any excess oil from the skillet and leave about 2 Tablespoons of oil. Add onions, garlic, hot sauce, smoked paprika, sugar,browning sauce, ketchup, bell peppers and salt to taste. Stir for about 2-3 minutes until onions is translucent. Then add to crockpot, deglaze pan with about ¾ cup of water add to slow cooker, together with ketchup, brown sauce and any remaining marinate from the chicken. It’s available in Caribbean Markets, Wal-Mart and even some supermarkets. Don’t sweat it! You can certainly make this without burnt sugar. 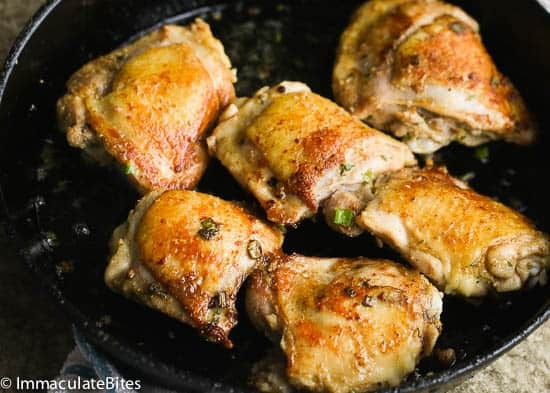 Heat up a skillet or large sauce pan with about 2 tablespoons oil, and then brown the chicken about 3-4 minutes until chicken is golden brown Drain any excess oil from the skillet and leave about 2 Tablespoons of oil. Add onions, garlic, hot sauce, smoked paprika, and bell peppers. Stir for about 2-3 minutes until onions is translucent. Add to crockpot, deglaze pan with about ¾ cup of water/stock then add to slow cooker, together with ketchup, brown sauce and any remaining marinate from the chicken. Cover and cook on high for about 3-4 hours. Are you on Instagram? Then join me for a visual feast of tasty recipes . Can you make this with boneless breast? That’s all I have right now? do i really only put a half teaspoon of each seasoning in the marinade for SIX pieces of chicken? or do i multiply by chicken pieces help!! Hi Terry, you use half a teaspoon of each seasoning . Do not multiply – 3 teaspoons all together. 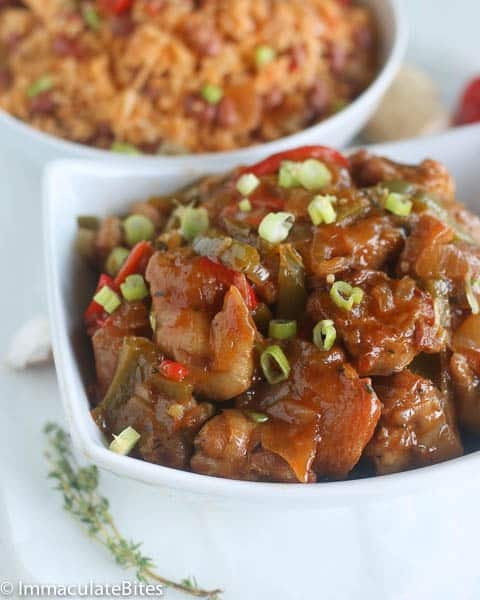 My whole family LOVES this recipe with your rice! So much flavor. 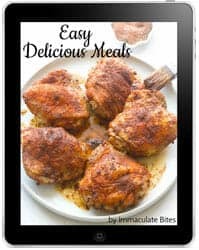 I just discovered your blog and am going to be trying a ton more recipes! This was my first and I can’t wait to try more. Giving it a try tonight in the dutch over. My chemo ran waaayyy long so I’m tryong to speed it up some. Looks and smells delicious so far. Thanks for the recipe! Hi, I’ve cooked this recipe before and it was delicious, what can I use instead of chicken bouillon? As I can’t seem to find it anywhere. Hi Anouska .Leave it out if you can’t find it. Hello imma actually i did not try any jamaican food in my whole life but i will definitely give it a try and the good part is i love chicken. I made this and I’m making it again Saturday. I also added a can of coconut milk and potatoes during the last hour in the crock ….served over a bed of rice with a side of cabbage and vegetables. That sounds delicious! So happy to hear it worked out well for you. I made this dish for the first time tonight, along with the rice and peas recipe (recommended to go alongside) and it went down a treat. Me, my partner and daughter loved it ! This is a brilliant recipe and look forward to following and cooking more of your tasty recipes. A big up from me in the UK. Yay! Thank you so much Chelcie. Can’t wait to hear which ones you try out. I just tried your recipe last night and it was a HIT!! I am soooooo proud of my self because this was my first time ever making a Jamaican/Carribean dish!!!! Needless to say , my husband was HAPPY and FULL!!! This is going in my recipe files. That’s terrific to hear Evita! Glad to hear you nailed it . Can I use Soya sauce instead of browning sauce? I cannot wait to try this recipe, it looks delicious. Delicious, the whole family loved it. Will be making more of your recipes going forward! Wohooo! Can’t wait for you to try my other recipes. Hi Mary. Browning sauce aka burnt sugar is a condiment use in most Caribbean households to add sweetness and color in stews,soups, and even cakes. You can find it in Caribbean markets and even in Walmart. Awww, you are too sweet Cristina.That is such a nice thing to say . Your husband is very lucky to have you to cook such amazing food for him. All my love !!! Followed the recipe except for Browning sauce and green onions. It still turned out great! Hubby requested this dish and he liked it. I’m so glad you both liked it! Thank you for taking the time to share your feedback. Hi there! I recently found your food blog & i am so happy that i did……I made this recipe last Friday and it was huge hit! It has definitely been added to my recipe book. I plan to try many more of your recipes in the very near future, more like this Friday lol!……… I’m not sure if you have a recipe for Jollof Rice the Ghana way, if you do could share it please? Hi, Jill. I’ve tried dumping everything in the crockpot too and it wasn’t bad at all. As for missing those two ingredients, there’d be a slight difference in flavor and aroma. But it’d work fine. 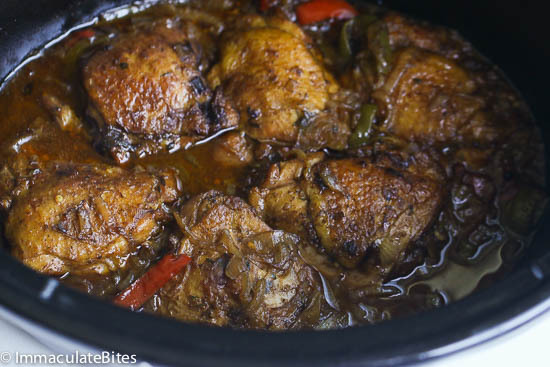 Check out this other recipe here https://www.africanbites.com/jamaican-browned-chicken-stew/, no crockpot needed. This recipe looks great. 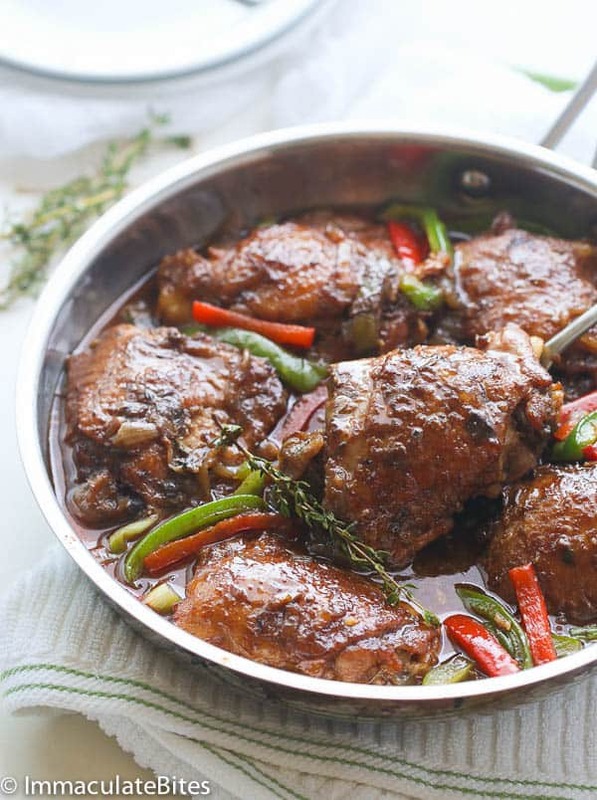 I am cooking your Slow Cooker Tuscan Chicken Stew right now. I have a question. When I cook with thighs, it takes so long for the prep because my boneless & skinless chicken thighs always have so much fat that I trim off as best I can. Am I being to fussy about trimming the fat or is their a trick to trimming the fat that will reduced the prep time? I’m thinking about using chicken breasts next time. This looks delicious and will definitely give this a go this week! Can you pressure cook instead and if so for how long? Thanks ! 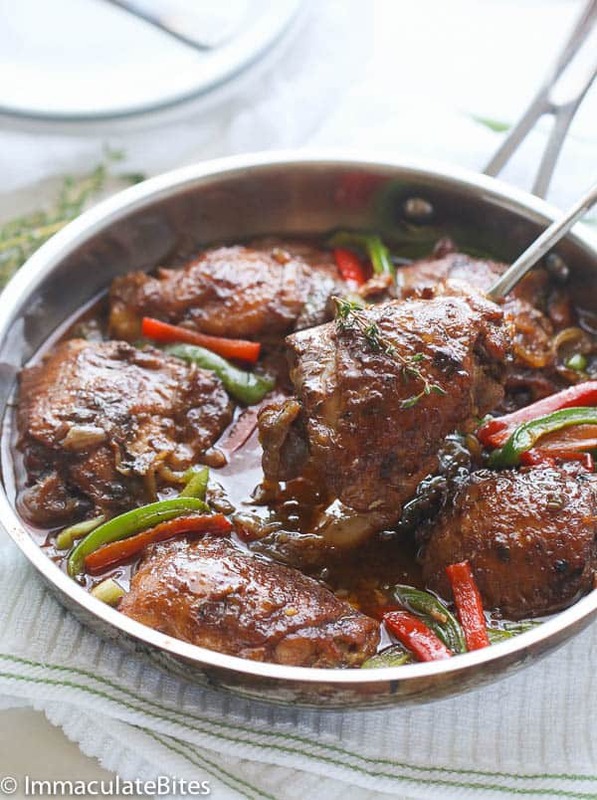 Cook it for about 7 minutes or more , depending on how well you like your chicken – The recommended time is between 8-10 minutes.